Acer Aspire E 15 is a budget laptop with some features you normally don’t find from a laptop at this price range. It has some good features and a good amount of ports, but does it live up to the expectations of a budget laptop and how does it really perform? Acer Aspire E 15 comes in a 15.02 x 10.2 x 1.19 inch and weights a 5.27 lbs. As anyone can see its not the slimmest or most portable budget laptop, but the overall quality is still surprisingly good. The brushed aluminum top looks good and palm rest is sharp. Something we did notice is that the DVD tray did feel a bit flimsy so you might want to keep your eye on that. A nice touch from Acer is the removable bottom panel that lets you get your hands on the RAM slots and drive bay letting you swap those quickly and easily if you need to upgrade your laptop. The Acer Aspire E 15 comes with a 15.6-inch LCD display packing a 1920 x 1080 pixels. Unfortunately, the Aspire E 15 display falls short on with the dimness of the display. It only has around 230 nits while 250 would be a minimum at least in our standards. You notice the dimness of the display easily when you’re close to a window or somewhere lighter. There is also the problem that you start losing colors when you move your head from side to side. Though all of this was kind of expected from a laptop paying under ~400 $. As for the storage options we went with the 1 terabyte of HDD, but you have the option to change this to a 250 GB WD Blue SSD which we do recommend for anyone wanting a bit more speed. Though then you might need to get an external hard drive, like the Toshiba HDTB410XK3AA which has a 1TB of space, to back up all for files. The hardware on the Acer Aspire E 15 is very good compared to the price point. You get an Intel i3-8130U (2,2 GHz up to 3,4 GHz), 6 GB DDR3, 802.11 ac wireless and a nice 1 TB of storage. On the top bezel of the display, you can find the 720p webcam of the Acer E 15. The image quality is average at best, but what really would need some work is the videos you can capture with this camera. The videos look muddy and could use some work, so you might want to take this into consideration when buying this laptop if you are into Skype or other video chats. 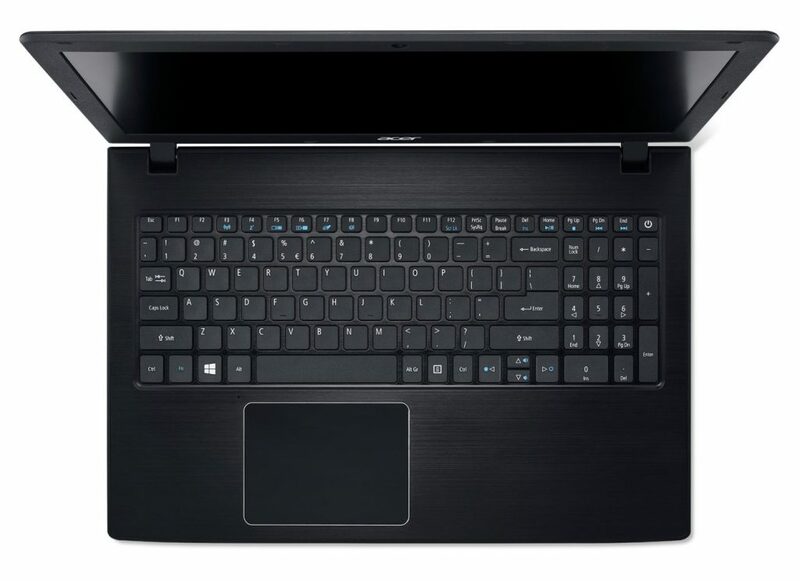 Acer has packed the Aspire E 15 with a relatively large amount of ports. On the left side of the laptop, you can find USB 3.1 Type C port (up to 5Gbps), Ethernet jack that is equipped with hinged drop-jaw, VGA port, HDMI and a pair of USB 3.0 Type A ports. Top of the left side you also got the Kensington laptop lock so you can lock it up if needed. The right side of the Aspire you got a USB 2.0, the DVD tray, combo audio jack, and the power input. The speakers are average. This really is the best you can say about them, but again we need to remember that this is a budget laptop, so we can’t expect the best sound quality. They work just fine when watching YouTube, Netflix or Amazon Prime and if we need a better quality we can always plug in some headphones. Acer is running a Windows 10 home, but we do have to mention that we did notice a lot of bloatware on the laptop. Something we wish we didn’t see so much on laptops these days, but this probably is just a problem with the budget ones. The Acer Aspire E 15 is clearly not made for video editing or even gaming, but basic work-related stuff like Microsoft Word, PowerPoint, Excel and other programs you would need for school or work run smoothly. The Intel i3 isn’t a huge powerhouse, but it does work fine for browsing and basic document editing. There seems to be also a small issue of over heating when the laptops is under heavy use which again makes it throttle a bit. Writing with the laptop is comfortable, though the travel is only 1.1 millimeters while the recommended minimum is 1.5 millimeters for the best feel. Thankfully though the keys are well spaced and you get a full number-keypad as well. The buttons feel springy and are overall pleasant to use. They force for each press is about 72 grams which is pretty ideal. Something that really shines on this budget laptop is its battery. Acer promises around 13,5 hours though in our heavy use we got almost 9 hours of battery time. This is around an hour more than other similar budget laptops. As expected in the budget laptop category the Acer Aspire E 15 isn’t packing a dedicated graphics card and heavily relies on the Intel HD Graphics 620. If you are looking for something that can work for midrange gaming then you may want to consider the ASUS VivoBook M580VD-EB54. This comes with a dedicated NVIDIA GeForce GTX 1050 gaming graphics card or perhaps the Acer Predator Helios 300. If you’re looking a great budget laptop for daily use then the Acer Aspire E 15 is the budget laptop for you. With a robust exterior and tons of different slots to connect your PC with to any possible device you need.